Last fall, when many Democrats still hoped that the Occupy Wall Street movement would become a left-wing Tea Party, Massachusetts Senate candidate Elizabeth Warren seemed to be the politician best positioned to benefit from the support they could generate. Like the protesters, the Harvard Law professor was advocating for middle and working class Americans against Wall Street and the powers-that-be. When the movement was at its height, she openly sided with the thousands of people camping out and waving signs in Manhattan’s Zuccotti Park and on downtown plazas in other cities across the country. “I created much of the intellectual foundation for what they do,” Warren told the Daily Beast in October 2011. But something has happened to the courtship between the consumer advocate and the populist movement. Since she began campaigning in earnest this past spring, Warren has scrupulously avoided mentioning Occupy Wall Street. And for their part, the remnants of the movement have become estranged from the candidate who embodies their values as much as any mainstream politician can. What happened to this once promising relationship? The GOP attacks may be taking their toll. Despite the state’s indigo hue, nearly half of Massachusetts voters consider themselves independent. These voters, who provided Scott Brown with his margin of victory in January 2010, appear to be wary of dirty young people who they believe do not to have or do not want jobs. Brown’s and Rove’s attacks ruffled Warren. Just a week after Rove’s PAC began running ads, Warren refused to sign a petition from the Harvard branch of the Occupy movement. As her lead in the polls has disappeared, she has distanced herself further from the protestors. A quick search of Massachusetts’ newspapers during the last six months fails to come up with single public comment by Warren on the Occupy movement. And her key supporters are equally determined to dissociate her from the protestors. Patrick Murphy, Lowell’s 30-year-old mayor and a self-styled independent, was visibly uncomfortable when asked at a Warren event whether Occupy Wall Street had resonated with his constituents, some of whom are still running their own local Occupy branch. “I don’t see that as something that really took off the way people hoped,” he said, and quickly changed the subject to Scott Brown’s failures as the Bay State’s junior senator. What remains of the Occupy movement in Boston has continued to hold general assembly meetings in a Back Bay park four times a month. But their activities today tend toward protesting transit fare hikes and preparing for a field trip to Manhattan to mark Occupy Wall Street’s first anniversary in September. Supporting Elizabeth Warren’s campaign is not on their agenda. “I thought she made a lot of good points about the interests of privatization, about the lunatic idea that [the banks and corporations] created the wealth of the country,” said Dana Moser, a middle-aged art professor who joined about 20 fellow Occupy activists for a meeting on the grassy lawn of Boston’s Copley Square on a recent Sunday afternoon. But that’s not enough to arouse his enthusiasm. “I’ve had my heart broken so many times when I thought we’d get progressive change by voting for Democrats,” Moser said. 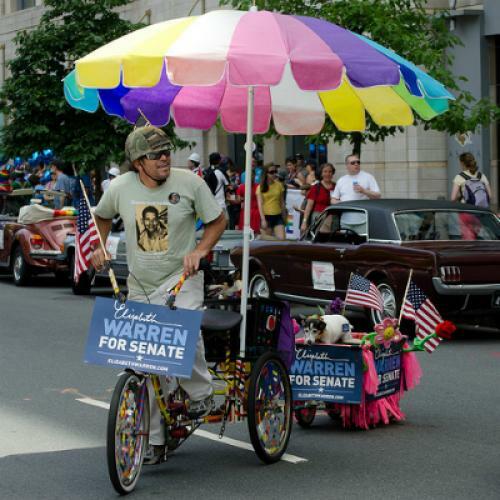 While some at the meeting pledged that Warren would get their votes, and one Occupy protester reported volunteering for her campaign, none of the activists were truly excited about her candidacy, and many were cynical about the very idea of elected office. A 66-year-old occupier sporting a gray ponytail and a T-shirt with the slogan “Sure, I’m a Marxist!” displayed above portraits of Chico, Groucho, Harpo and Karl, said he didn’t expect many of his fellow occupiers to vote at all. “Some people who voted for Obama say they can’t ever see voting again,” he said. And that means that in spite of Warren’s outspoken advocacy of their cause, these occupiers won’t be voting for her either.